Weight capacity for top bunk: 300 lbs. 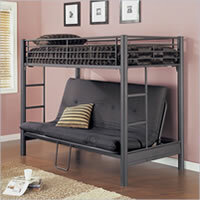 Powell's Monster Bedroom Twin over Full Bunk Bed provides two comfortable sleeping spaces for a very reasonable price. 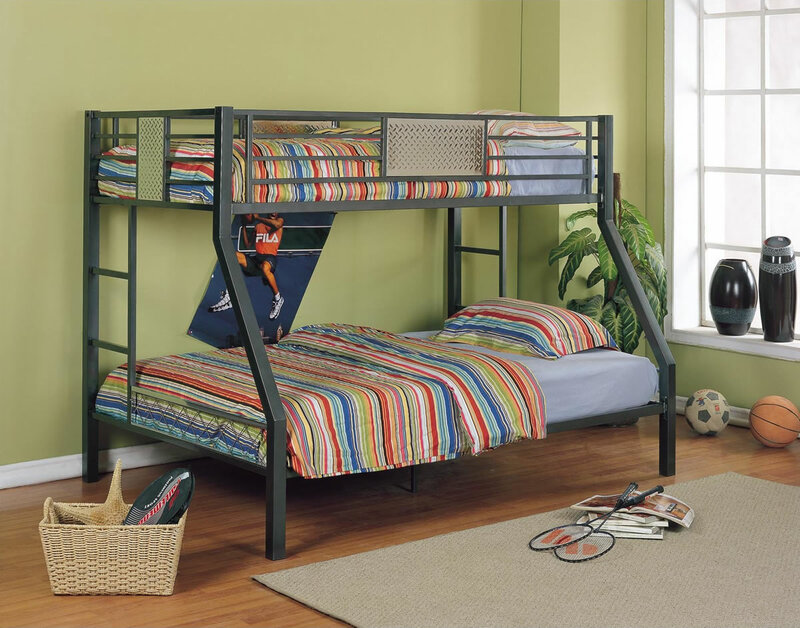 Made of heavy gauge powder coated tubular steel frames, this bed is as sturdy as they come and will easily endure any abuse your kids may throw at it. 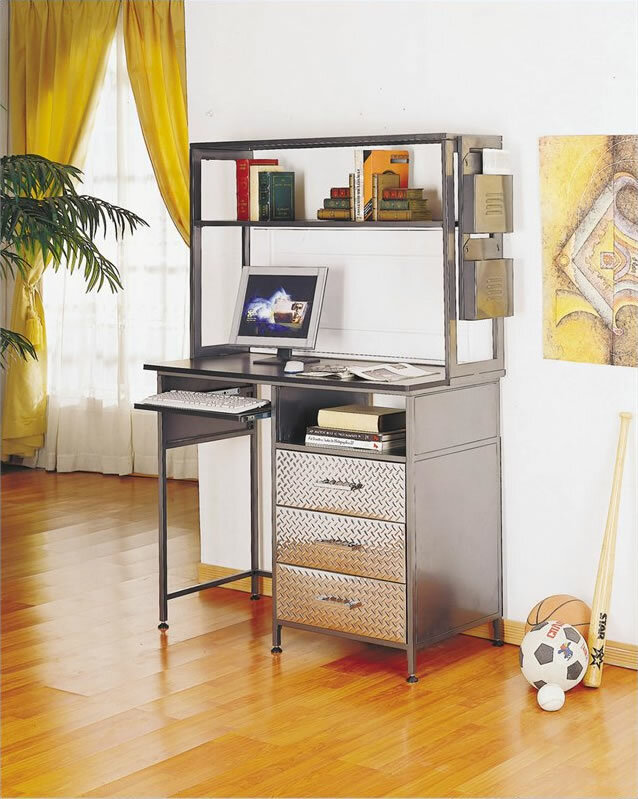 The solid construction, and this is especially applicable to the joints, eliminate or at the very least minimize the squeaking which is usually associated with metal bunk beds. The powder coating finish is considerably tougher than conventional paint and offers a much better resistance toward scratching, chipping, UV damage and rust -- bottom line, it will last for years to come. It also looks great and feels good to the touch. The textured chrome plated decorative inserts appear to have no other task than to look good and enhance the visual appearance of the bunk bed -- a little spice to prevent the product from looking boring. 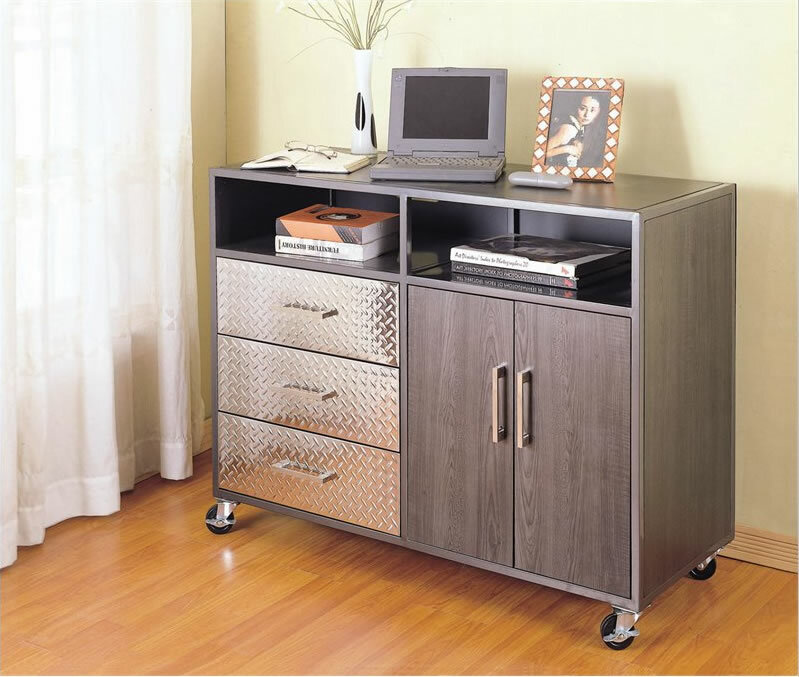 They also help the bed better blend in with the matching furniture -- you should be aware that this product is part of Powell's award winning Monster Bedroom collection which sports plenty of pieces to furnish the entire bedroom: 4-drawer chest, 10-drawer mechanics chest, 4-drawer mobile storage bench, student desk and hutch, swivel chair, computer stool, mobile storage unit and more. 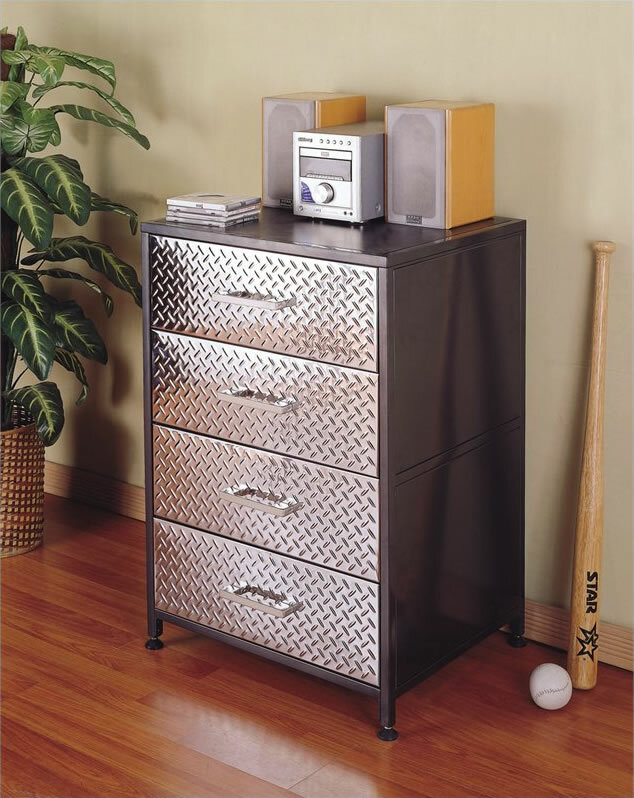 You might be especially interested in the underbed storage unit -- officially called the HQ Escape Storage Unit -- which features three large drawers decorated with the same textured chrome plates. Click on thumbnail below to see how that looks. 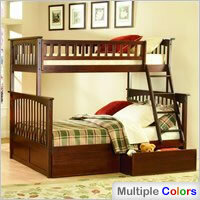 So what do buyers say about this bunk bed? Read on. 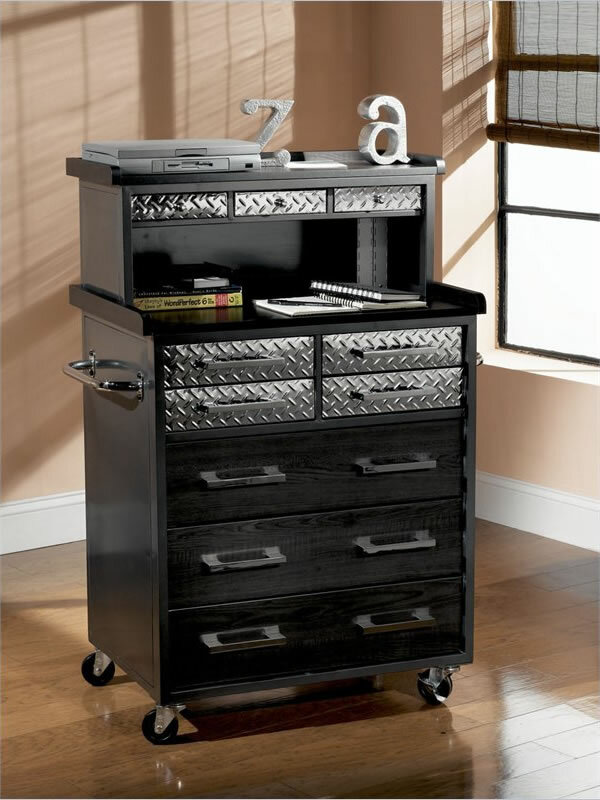 We can confidently say that buyers are pretty much unanimously thrilled with this product; we've seen almost nothing but five-star reviews on it. "Great" is the word most often used to describe it: a great piece of furniture; great buy; great, modern alternative to wood bunks; great bunk bed set; great construction -- you get the picture. Sturdiness and the quality of build -- these are the things users are impressed with above all. 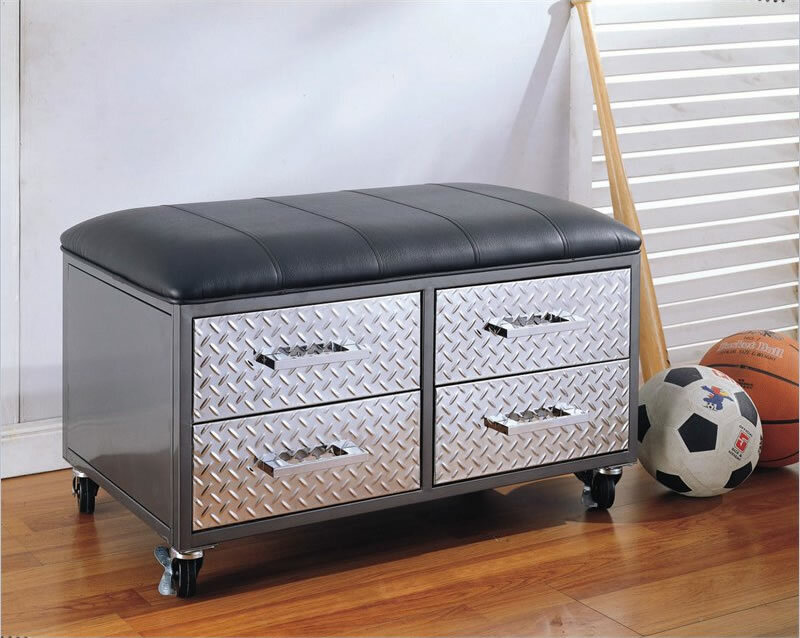 Some phrases related to the topic: a good and sturdy heavy use bed for pretty much anyone; very pleased with the quality of this piece; the quality is clear in the appearance and it has a high-end look and feel to it; don't think the kids can destroy this one; seems to be good quality and very sturdy; rock solid; strong enough that the boys can play on it without it budging an inch -- and it goes on. Also, it's been reported that with the metal bars supporting the mattress no bunkie boards or extra supports are needed. 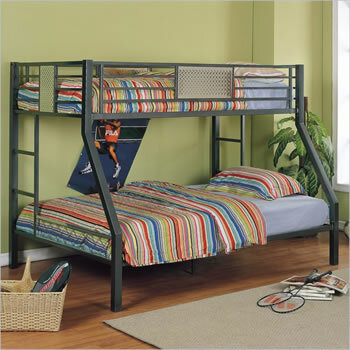 Attractiveness -- the bunk bed's simple, modern design with chrome plated accents seems to have won many admirers. The powder coated finish especially is reported to look great. Ease of Assembly -- by all accounts, putting this bunk bed together is not difficult at all and it takes less than an hour to do it. It is supposed to be even easier if you turn the bed on its side (whatever that means) during the process. Using a ratchet instead of enclosed tools should help a bit also -- at least according to one reviewer. The worst thing we've found on this bed is that it's difficult to change sheets -- but this comes with the territory, really. There are reports of some squeaking after a few days of use, but re-tightening the bolts supposedly takes care of it. This is a good place to remind you that you should do exactly that (re-tighten the bolts, screws, whatever) with any bunk bed after it's been used for a week or so. The bed posts can scratch the floor if you're not careful when moving it (the bed, not the floor); small felt pads placed under the posts should help in that regard.